Sometimes a game just sneaks up on you and gives you everything that you wanted. Graceful Explosion Machines was that game for me this year. It came out right around the launch of the Nintendo Switch right in between two mammoth Nintendo franchises (The Legend of Zelda and Mario Kart). Just about any other game would have been forgotten amidst that kind of competition, but Graceful Explosion Machine was a neon pink sign that helped me find my way. Graceful Explosion Machines is a classic space “shmup” (Shoot ’em Up) that is currently exclusive to the Nintendo Switch. It is also a spectacular video game. Anyone who has ever played any sort of arcade game will recognize the gameplay loop immediately. Players pilot a ship around various colorful levels. The goal is to eliminate all of the enemies in each level as quickly as possible and without getting hit. Eliminating those enemies requires careful use of the four different weapons at your disposal. Each of those weapons is assigned to one of the four face buttons. You have a standard blaster (that will overheat if you shoot too fast), a long range sniper blast that delivers continuous damage, a sword that swings around your ship, and a set of heat seeking missiles. The latter three of those weapons all share an energy bar. You cant just use those powers wildly. This careful use of all of your different weapons while flying through the various levels pushes you into an almost meditative state as you play. It’s easy to get lost in the game during those brief moments. The longer you are able to play in that meditative state (without failing a mission) the more joyful that state it. This makes Graceful Explosion Machine one of those games where it actually feels better to play as you grow in skill. That is so rare in today’s market that some kids have probably never experienced it at all. Fix that problem and buy this game for them. Trust me. It will be worth it. Is it a kid’s game? 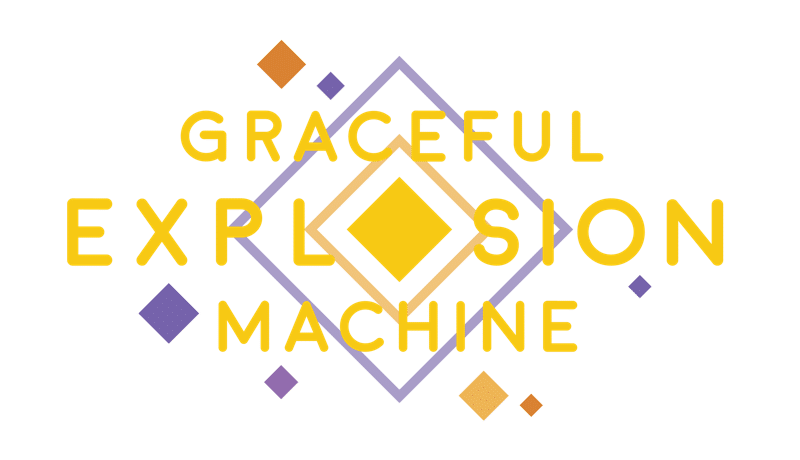 Graceful Explosion Machine is an arcade style game that is all simple shapes and bright colors. There is almost nothing to be concerned about with this game. There is no narrative that expressed mature themes. The game does involve a spaceship blasting other enemy spacecraft, but all them are such simple designs that the inherent violence is very abstracted. This is a modern equivalent to Space Invaders. Can a kid play it? There is no doubt that GEM is a challenging game. But, it is still a very inviting experience. Failing at a level is painless and restarting is very fast. The game does make use of all of the different face buttons on the controller and the should buttons as well so kids who aren’t used to that will have some difficulty. This is currently the best game available for the Nintendo Switch not called Legend of Zelda: Breath of the Wild. Play this game. Episode 83 Board Games: Jenna Finally Played Stratego! LEGO Marvel Superheroes 2 Announced!